The Department of Housing new guidelines on the design of apartments has had a mixed review from those involved in the construction sector. 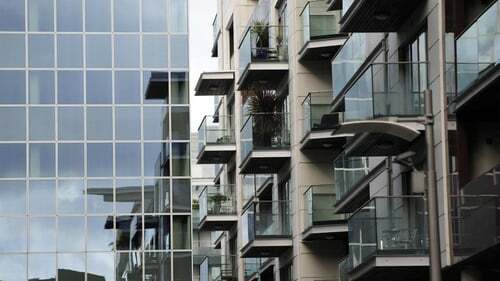 The Director of Housing with the Construction Industry Federation has said anything that makes apartment building more viable is to be welcomed, an architect and housing policy analyst described the guidelines as "very disappointing". Hubert Fitzpatrick of CIF, speaking on RTÉ's Today with Sean O'Rourke, said builders will reassess their sites in light of the new guidelines. He added that increasing the number of units will make construction more viable, which was crucial. Currently, Mr Fitzpatrick said, costs are not viable for builders. He pointed out that increasing the number of apartments, increasing the number of one-bedroom apartments, and reducing the number of lift shafts needed, along with changes to car parking requirements will reduce costs significantly for builders. He said he believed there is demand for build-to-rent models supported in the guidelines and the changes would stimulate building in cities. Earlier, Mel Reynolds, an architect and housing policy analyst, described the guidelines as "very disappointing". Mr Reynolds said he would have liked to see issues of affordability and height addressed. Speaking on RTÉ's Morning Ireland, he explained that height feeds into land price, improves viability and increases bottom line profits. Mr Reynolds said the overall rationale should be affordability and making units cheaper. He said developments will be stalled until there is further guidance on height restrictions because developers do not want to build a five-storey building, when they may be able to build a seven-storey building on the same site in six months' time. Mr Reynolds said there was a basic lack of understanding about how the development sector works in Ireland. He explained that promoting short-stay, intensive-use accommodation - such as shared and student accommodation - inflates land values in those locations and makes "normal residential long-stay accommodation" less feasible.